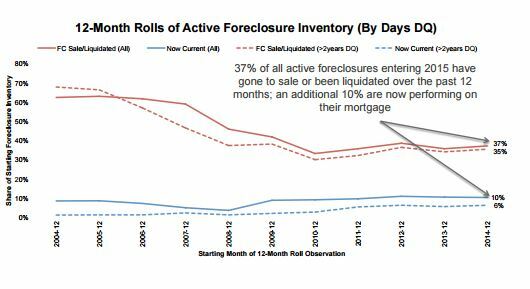 Foreclosure activity was way down across the board in 2015, with a noticeable decline in the foreclosure inventory down to its pre-recession level, meaning the backlog of foreclosures continues to clear out at a substantial rate. With nearly half of the residential mortgage loans that began 2015 in active foreclosure either liquidated or returning to current status during the year, foreclosure inventory ended the year at less than a third of what it was during its peak five years ago, according to Black Knight Financial Services’ December 2015 Mortgage Monitor released on Monday. About 880,000 residential mortgage loans were in active foreclosure at the start of 2015, and out of those, more than half (484,000) were at least two years delinquent, according to Black Knight. By the end of the year, 47 percent of the total number of loans in active foreclosure had either returned to performing status or were liquidated—about 1.5 percent higher than the total last year. About 41 percent of the loans that began 2015 at least two years delinquent had either returned to performing status or been liquidated, with 6 percent of them had returned to performing, according to Black Knight. As a result of all the loans that began 2015 in foreclosure being liquidated or returning to current status at some point during the year, active foreclosure inventory went from 880,000 at the beginning of the year to 689,000 at the end of the year. It was the first time that active foreclosure inventory ended the year at below 700,000 since 2006 (prior to the crisis) and at less than a third of their peak hit at the end of 2010 (2.3 million). Remaining foreclosure volume still ended the year at about two and a half times its “normal” level even with the declines, according to Black Knight. Foreclosure sales—a true measure of homes lost to foreclosure—totaled 377,000 in 2015, a decline of about 72,000 (14 percent) from 2014 and a decline of about 70 percent from their peak in 2010; however, foreclosure activity is still way above “normal” levels due to elevated levels of foreclosure inventory and 90-plus day delinquencies. In all, about 7.1 million homes have been lost to foreclosure since 2007, with 1.2 million of those coming in California alone; Florida (872,000) and Michigan (407,000) were second and third behind California in the number of homes lost to foreclosure since 2007. Click here to view the entire Black Knight December 2015 Mortgage Monitor.